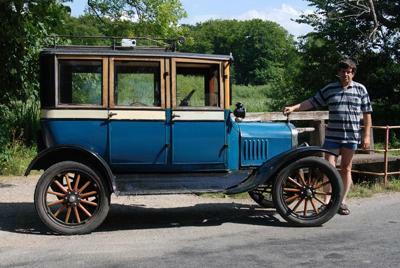 This car was as new a 1921 Touring and owned by the new grocer in the little village of Kettinge on island Lolland in Denmark. As the business grew, the need for a closed car to drive erands in for the citizens arose and the car was modified to be a closed 4 door sedan. This conversion took place in 1926 or 27. I believe the 30 x 31/2" wheels where exchanged with 21 x 41/2 wheels so the converted car looked more modern. A picture exists from 1957 with that configuration. When it was restored by Børge Kaa in the late 1950's it got its 30x31/2 wheels back and the colors it has now. I bought the car from Børge Kaa in April 2006.